Our sidewalks are finally done! The balconies are done! The parking garage is done! Soon the construction fence will come down and the sidewalks will open! Leasing of the apartments was accomplished incredibly fast. We have leases pending on 13 of the 14 apartments. Only unit 305 remains as of today – and this is a beautiful apartment. We are sure it won’t last long. The first tenants are scheduled to arrive on May 1. We will now put our full efforts into completing the new Penn Herb Company store. Check back for updates! After a brutally cold winter that never seemed to end, we are finally able to work outside again and finish up the exterior of the Liberties Gateway Building. One sidewalk on Hancock Street has been completed, and the other will soon be done. Hancock Street has been rebuilt, and was recently paved. Paving repairs were done and new curbs were installed on Green Street. We are now installing the balconies, and weather permitting, will finish the other sidewalks as soon as possible. We hope to reopen all the sidewalks in just a few more weeks! On the interior, the 14 beautiful apartments have been completed and are now leasing! Pictures of these luxury apartments have been posted on this site, along with rental rates and the lease application. The decorative tile floor in the lobby and the elevator has been completed. We hope to have all our approvals by the end of April, and are projecting a move-in date for the apartments of May 1. The automatic doors have been installed in the new Penn Herb Company store. The concrete floors have been polished, and soon the store fixtures will be installed. Keep checking back for updates! We are excited to report that the Liberties Gateway project is nearing completion. Although it may look like little progress has been made from the outside, much progress has been made inside the building. Fourteen apartments on the 2nd and 3rd floor are almost complete. All painting is done, kitchens and granite countertops have been installed, and beautiful hardwood cherry floors have been completed. Kitchen tile is almost complete, and brand new kitchen appliances are being installed. All energy-efficient LED lighting and closet shelving has been installed. All the heating, hot water and air conditioning units have been installed and are now functioning. We are waiting for final inspection on the elevator, which should happen shortly. A few more details need to be completed and the apartments will be ready to move in! We will start taking applications for rentals very soon – look here for updates. Before we can receive an occupancy permit, we must complete the exterior. First the brick and limestone must be completed, and finally the curbs and sidewalks. Issues with the limestone façade have caused unforeseen delays holding up completion. The exterior is being constructed of a combination of brick and large limestone panels, some weighing thousands of pounds. They are custom cut in the state of Indiana, trucked to Philadelphia and then installed. To our dismay, the original limestone company that was contracted to manufacture the panels was not getting the work done for us, causing serious delays, and to top it off, they went bankrupt. This made it necessary to locate an alternate supplier to complete the limestone fabrication. Because this second supplier also took on work from other customers affected by the bankruptcy, deliveries of stone have been months behind the expected schedule. This situation has been frustrating for us, our employees, as well as our customers and Northern Liberties neighbors. We apologize for the delays, which have been largely out of our control. We want to finish this project as much as you want to see it done! The good news is that last week we finally received a large shipment of limestone, so work has resumed on the exterior of the project. The final two shipments are expected very soon. If the weather continues to be favorable, the brick and limestone should be completed within a month. As soon as this is complete and the scaffolding is removed, then we can work on the sidewalks, weather permitting. Meanwhile, much work is continuing daily inside on the new Penn Herb Company store. Drywall is almost complete, electrical wiring is nearing completion as is the plumbing. The beautiful large glass store windows were being installed this week and will be completed next week. Cabinetry for the new store is being custom built at the same time. Yes, there are still a lot of things that must be done for everything to come together – but the end is in sight. Although the exterior work is dependent on weather conditions, if all goes well, Liberties Gateway and the new Penn Herb Company store should be open for business in the first quarter 2015. Keep checking here for further updates. In the first and second weeks of April 2014 – the Liberties Gateway Apartments were delivered and installed. There were 34 tractor-trailer size modules that were delivered and set with a large crane. Each unit was constructed to fit exactly into the next unit, so that everything came together perfectly on the site. The apartments are almost completely finished inside, with the kitchens and bathrooms already installed. The walls are complete and painted. The plumbing, electrical, heating and air conditioning has all been installed. You can really get a feel of how nice these apartments will be! There are floor to ceiling windows in every unit. There are balconies with great views of Center City, the Benjamin Franklin Bridge, Second Street and the Delaware River. The elevator mechanical system was also installed for access to the parking garage and the first and second floor apartments. In the next weeks, work will continue construction to seal up the roof, install the limestone and brick exterior, finish the apartments, and finally begin fitting out the new Penn Herb Company Store! We hope to have the project completed and ready for occupancy sometime soon! 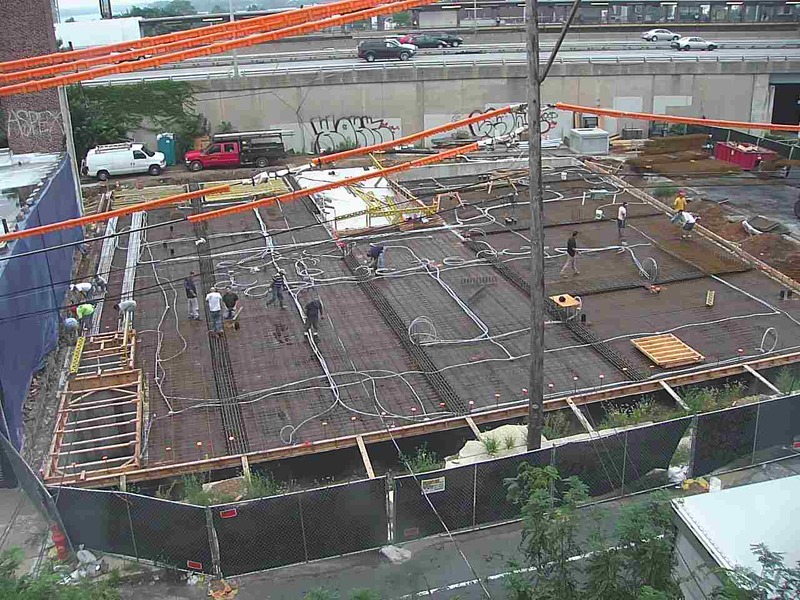 By the end of September, the concrete on the first floor slab was complete. There was 310 yards of concrete poured in the first floor alone – that equals 31 truckloads. No doubt that the floor for the new Penn Herb store will be very solid! More concrete to come! Sorry. It’s been a while since we posted construction updates. We’ve been really busy working on the project! So here is an update on what was completed back in August. The rebar was placed for the first floor concrete, and all the electrical conduit was positioned in the floor – almost ready for concrete. 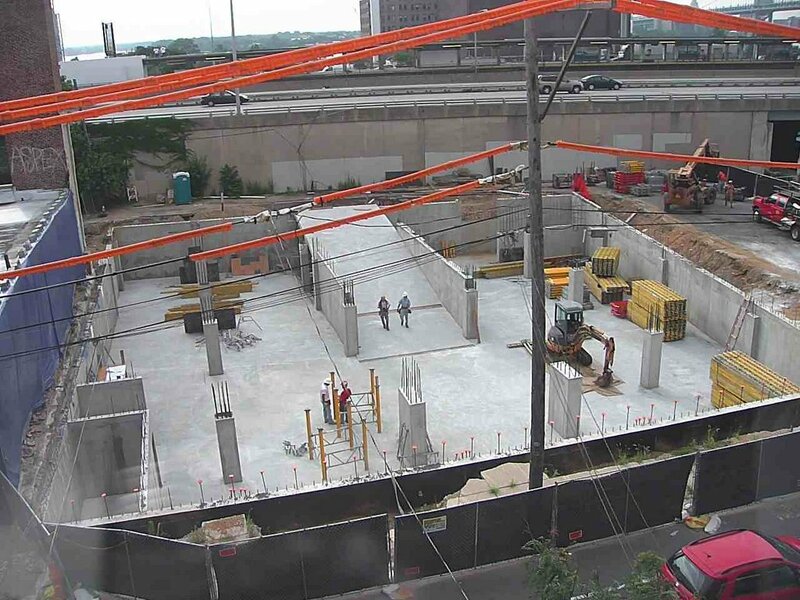 Now that the parking garage floor concrete has cured sufficiently, the forms are being erected to support the first floor concrete pour. Weather is extremely hot here in Philly, with temperatures nearing 100 degrees, so workers are starting early each day. On June 27, we visited the factory where the modular units for the 14 upper floor apartments are being constructed. There are 34 individual boxes being assembled, 17 for each of the 2 floors of apartments. We are building one floor of apartments at a time, so there are 17 boxes being constructed now. All are laid out in the factory as they will be installed. So you can actually walk through the apartments already, although there is a gap of about 5 feet between each box. The 9 1/2 foot ceilings and floor to ceiling windows give a really open feeling in the apartments. Should be some amazing views of the Center City skyline when they are installed on site! All plumbing, heating and air conditioning, fire sprinklers, and gas connections are being installed in the factory. Within the next few weeks, the kitchens, bathrooms, flooring and tile will be installed. Besides some minor finishing touches, the apartments will be complete when they leave the factory. When lifted on-site with a crane, all connections will be hooked up between the boxes. This will be the corner apartment on the 2nd floor. Notice floor to ceiling windows. There will also be a sliding door on to a balcony.